Whether it’s a daffodil or a giant sequoia, a plant is a relatively simple closed system. Its ultimate growth is driven by basic environmental factors such as light, water, soil and accessible nutrients. The nurseries that produce these plants, however, are much more complicated. In theory, everything that happens should contribute to the growth of the plants, and the nursery will therefore be profitable. But in practice, inefficiencies are everywhere. More and more growers are putting themselves under the microscope and examining every step in the plant production process to determine what is truly necessary — and what is waste. To see the difference, and act on it, requires a change in outlook. And many nurseries are embracing that sort of change. Some efficiency-minded growers have adopted Lean, also known as the Toyota Production System. It gives users the tools to identify and eliminate waste. People often think of waste as “what goes in the trash can,” but in the context of Lean, the meaning of “waste” is broader. It’s defined as anything that does not enhance the product’s value for the paying customer. A key precept of Lean is that the customer pays only for the product. Anything else is waste, and the producer pays for it. By reducing waste, any business — including a wholesale nursery — can lower costs, increase quality and make profits more likely. Rick and Elizabeth Peters, husband-and-wife owners of The Peters Company, are Lean consultants who operate Lean nursery consortiums in Oregon and Washington. As such, they work with several growers seeking to make their processes leaner. There are 10 green industry businesses participating in the two consortiums, and expects to see more signing up. Although Lean is a significant and formalized commitment for a business to make, other growers have simply looked for efficiency informally, where they can find it. We visited with several growers who have taken steps to become more efficient. They’ve adopted a team management approach, adopted better workflows, improved their use of inputs and even rearranged their workspaces to make everything come together like clockwork. Although each nursery is different, the principle is universal. 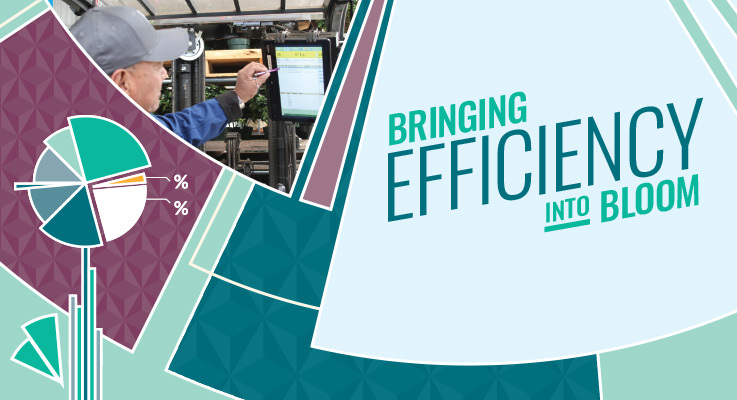 The power to be more efficient rests with growers and employees. We hope these examples will provide information as well as inspiration to improve your bottom line.